Yet again another doubler! This one featured in the 2012 Calendar HERE. I had hoped it was slightly different - maybe matte or textured - but no such luck! This is hard to apply and really streaky. Like the one before it, a total nightmare! I think I could class this as part of my Ciate Nightmare Gang (Doll House Collection, et al). Having had 2 years more experience painting my nails, I tried my best to deal with it. Drying was slow because I used thick coats (probably 6-7 minutes at least per coat). Thick coats and minimal brush strokes are the way forward with the polish. And that's difficult because it is a mini, probably applies better with the full sized bottle! All that said I still really like the polish! And it did last well. 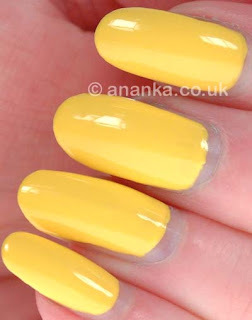 My Personal Rating = 7/10 :-) Poor formula but nice colour! Really, they should have hmm? 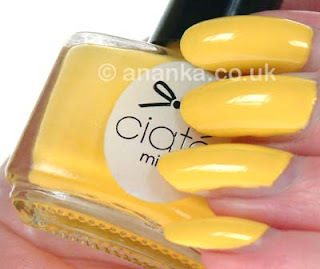 Yellows are SO troublesome to apply but they're so cool, eye catching and striking :) Ciate Nightmare Gang, lolol!! Polishes that spendy shouldn't be nightmare inducing. Oh too bad about the application :( I think the colour is amazing though! Very pretty!!! I love yellow color!!! Yellow looks really great on you. But anyway, disappointing to have another doubler. Ah well ~ but it does look a stunning yellow! Esse esmalte amaraelo esta show amei. sad you got another duplicate... at least they waited 2 years before re-using this one though lol... i find yellows are generally extremely streaky :( i love light yellow though!